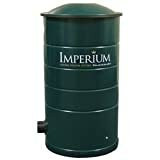 The Imperium CV280 is an all steel central vacuum power unit made of galvannealed steel. Galvannealed steel is made by combining the process of galvanization and annealing. This process produces a very fine matte finish that acts like a primer, easily adheres to paint, and is very rust proof. With a superior powder coated finish, this is a unit that will resist rust and corrosion for years and years. The powerful, flo-thru motor is manufactured by Ametek-Lamb, the folks that have been putting motors in the very best central vacuum systems for years. No central vacuum system on the market today can give you this kind of performance and value for your money. With 561 AirWatts, the Imperium CV280 is powerful enough for homes up to 3000 square feet. Imperium central vacuum systems are manufactured by a company with over 50 years of central vacuum manufacturing experience...and they are manufactured right here in the USA!